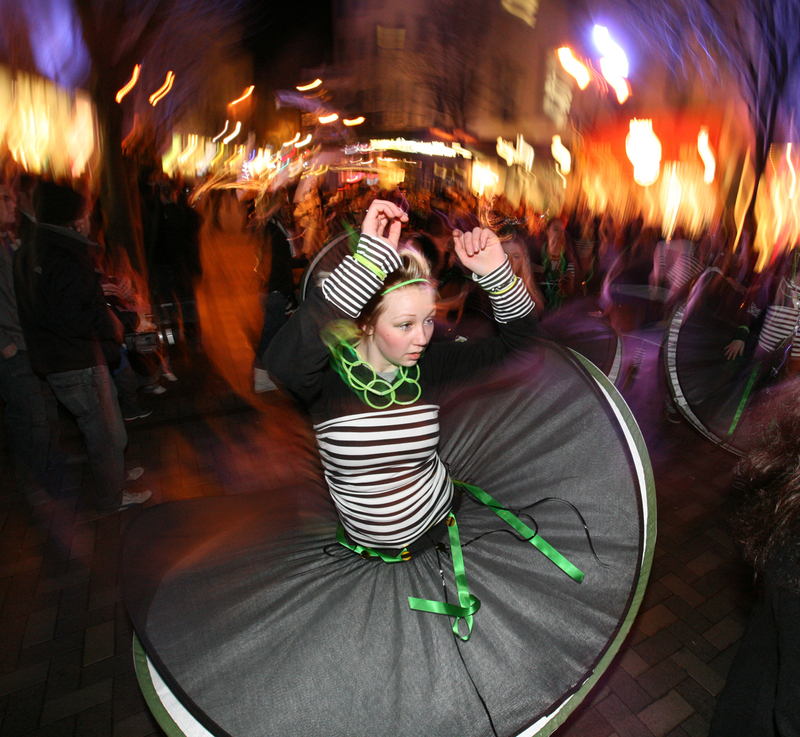 The Nottingham Light Night festival transforms the city and brings it to life after dark through illuminations, spectacles, music, street theatre and much more. City Arts has been creating work for the festival since it started in 2008. 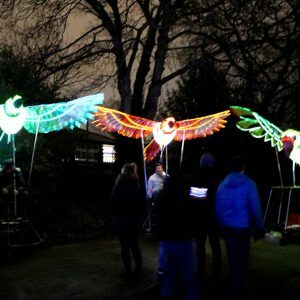 In that time we have worked with hundreds of people to create exciting illuminated events. City Arts brought to Nottingham’s Old Market Square an exceptional sonic space. 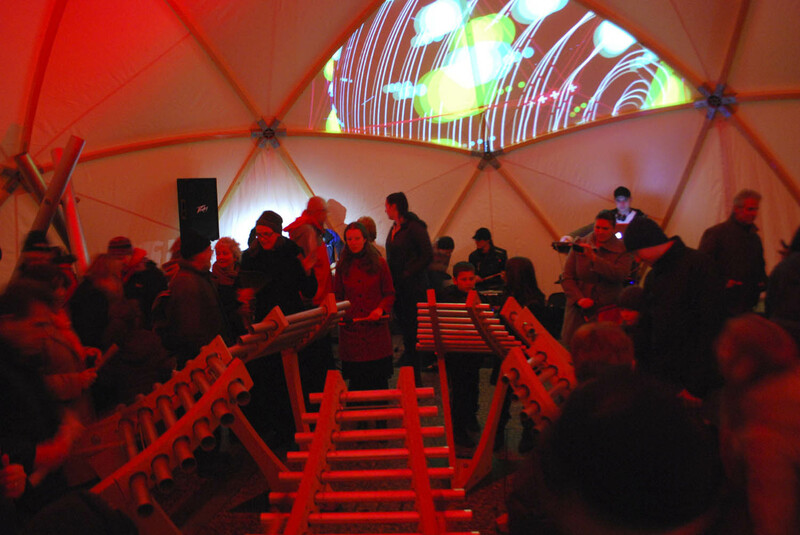 Housed within our beautiful dome, we installed our chime instruments for the public to use. 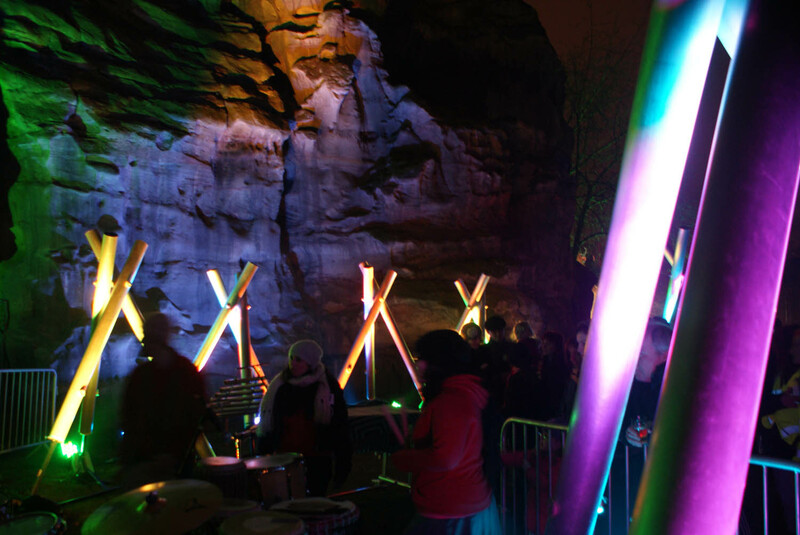 They were accompanied by professional musicians who created a soundscape for the public to build on made up of tabla, kit drums and an electronic landscape. This was illuminated by digital projections visible both inside and outside the space. 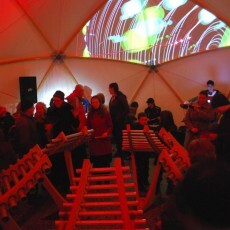 Over 2000 people came to play the instruments and enjoy the atmosphere, despite the cold February evening. 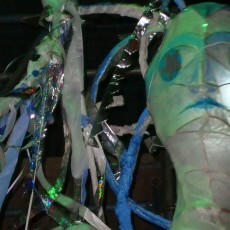 The Star-child and Eternal puppets stepped out for this year’s Light Night in early February. The two puppets, developed as part of the Imagination Our Nation project, take a team of five people each to bring them to life. Young People, volunteers and the City Arts team took the puppets on a walk around Nottingham City Centre and, despite it being one of the coldest nights of the year, they made a great impact with the public. 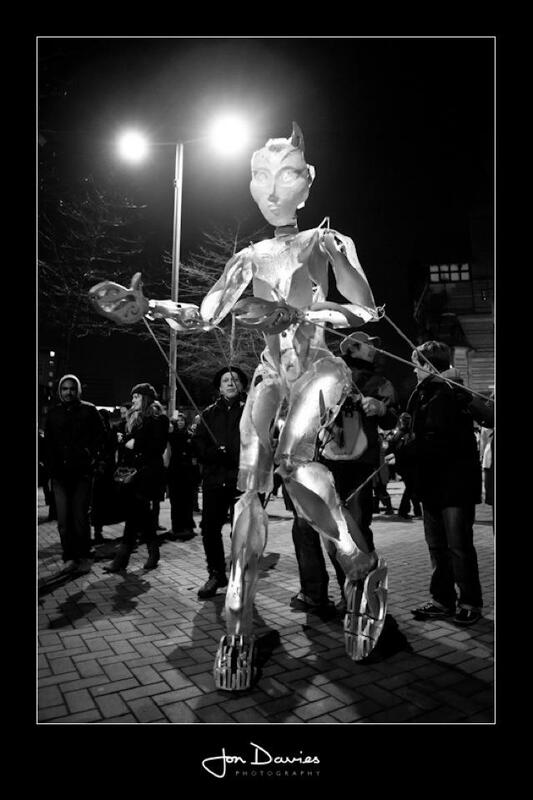 The beautiful inbuilt lighting of the puppets meant that they were able to pick their way through the dark streets, gathering people as they went. City Arts created work for the Nottingham’s Brewhouse Yard Museum Gardens. We created a Winter Garden showcasing the creativity of children, young people, adults and the public on the day. The evening involved a series of processions, events, interventions and installations with the project underpinned by numerous exciting partnerships. An extensive workshop programme led up to the event. This involved 15 primary schools creating a canopy of ‘Wish Leaves’ – 1,000 giant oak leaves decorated by the children were festooned across the site. These were illuminated from below, casting shadows on the buildings and visitors. A chimes sonic installation was set up, and musicians Emma Williams and Michael Davis were commissioned to create anew piece of music for chimes and drums. Young people, artists and volunteers from the national Imagination Our Nation programme came with 20 illuminated walkabout puppets, including our own Starchild and Eternal. Our own Thursday Group led by artist Keith Dorn, created a giant illuminated pyramid, inspired by the four seasons. Arts on Prescription worked with artist Rosie Hobbs to create two textile archways to welcome people into the site. Finally, the whole park was illuminated by young people from the BTEC performing arts course at the Brunts School in Mansfield. 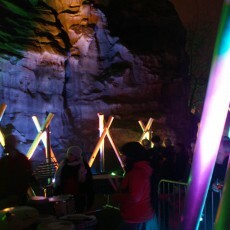 Students designed and installed the lighting patterns and helped with the overall management of the event. 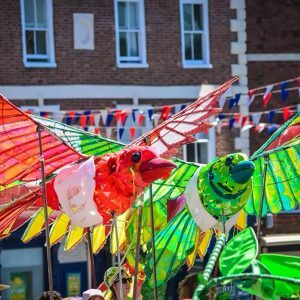 City Arts created an illuminated winter carnival, bringing together children, young people and adults in a celebration of dance, music, costume and colour. We finished the construction of the giant chimes, and were able to premier their use. 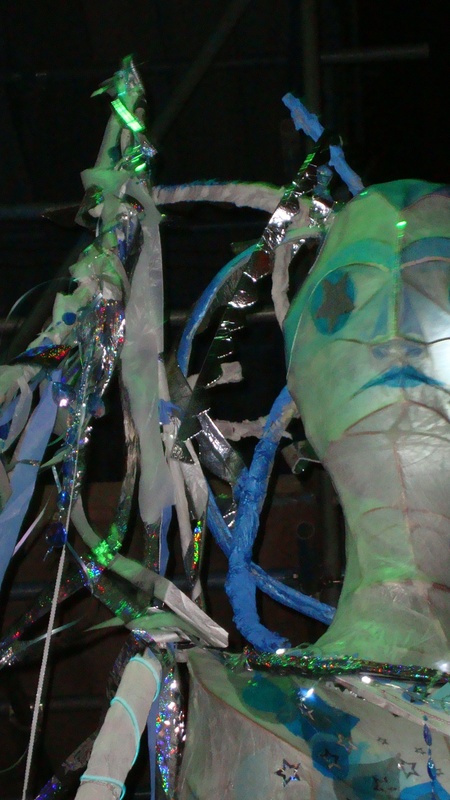 Two giant illuminated puppets were created and animated with young people, as well as the Starchild and Nottingham Goddess taking centre stage. Groups of dancers from Top Valley and Manning schools led the event, accompanied by percussionists from around the world, including the Gambia and Angola. 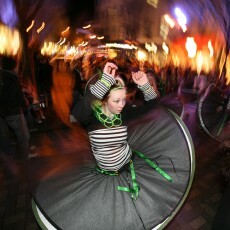 City Arts, in partnership with Nottingham City Council, delivered a street and carnival spectacular at the 2009 Light Night event. 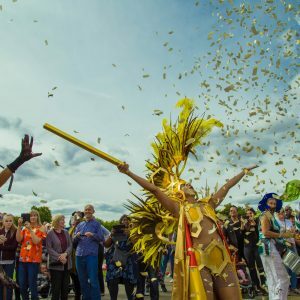 This was part of the national Imagination: Our Nation programme, led by London Carnival Arts organisation Kinetika. 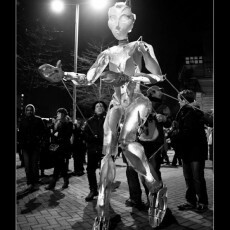 City Arts has taken inspiration from this programme and developed ImagiNation, the Nottingham part of the ION programme. A programme of workshops was delivered and new partnerships were formed in the run up to the event, including Manning School and their ‘gifted and talented’ dance troop. Artist Jessica Kemp delivered a number of costume making sessions with this group to create large spinning skirts and an overall ‘look’ for the troop. Musician Mark Evans worked with year 7 students to develop a rhythm orchestra to accompany the Manning dance troop. A second musician, Michael Davis, worked with a City Arts’ adult Arts and Health group, teaching them to play the small scale chime instruments he has developed. He also worked with musician, singer and former City Arts Administrator, Donna Briscoe-Green who performed as the Goddess, to develop a vocal line that could feed into the music of the chimes. Artists from the new Artists in Exile programme, including the co-ordinator Gaylan Nazhad, joined in the procession to bring an international dimension to the event. Young people from the Urban Circus group developed some of the narrative of the programme, and performed circus skills on the night, including using glowing spinning Poi.